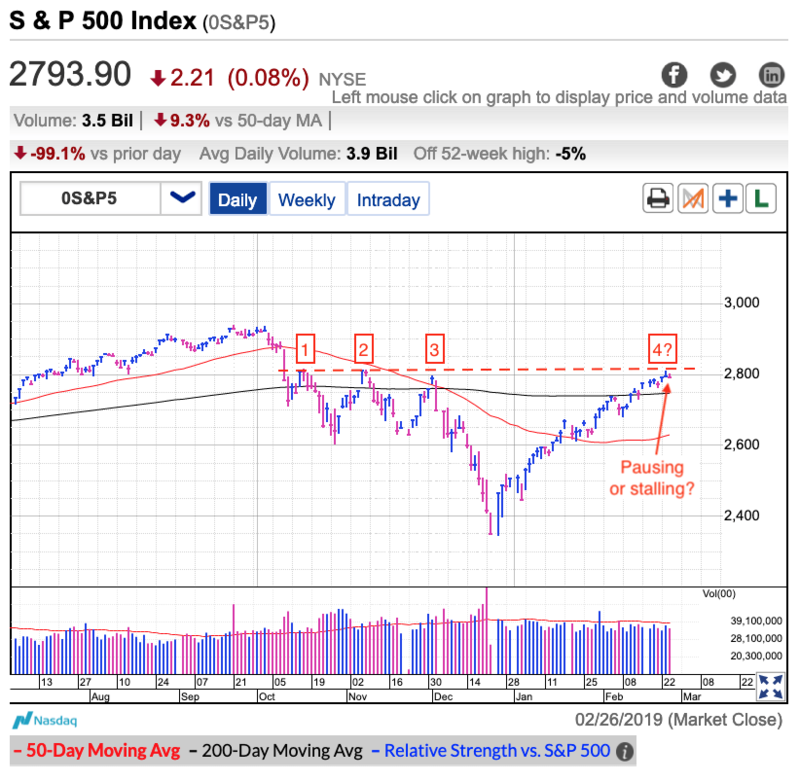 The S&P 500 slipped Thursday morning, but those early losses were modest and failed to ignite wider selling. The biggest headline was Trump walking out of negotiations with North Korea. This development has limited implications for the US economy and is why it didn’t affect the stock market. But could this foreshadow a potential outcome during Trump’s far more critical meeting with the Chinese president? Could all the hype and hope surrounding the imminent trade deal turn into a similar bust? Given the market’s resilience today, it doesn’t seem worried, but sometimes it takes more than a subtle hint to get the market’s attention. Prices continue to hover underneath 2,800 resistance. Even though Monday’s breakout fizzled, only pulling back a small amount is actually a bullish signal. If prices were overbought and vulnerable to a larger pullback, it would have happened quickly. Instead, prices continue hovering near the highs as confident owners refuse to take profits because they are waiting for even higher prices. That tells us this market wants to go even higher. But all of this is dependent on a stable headline environment. 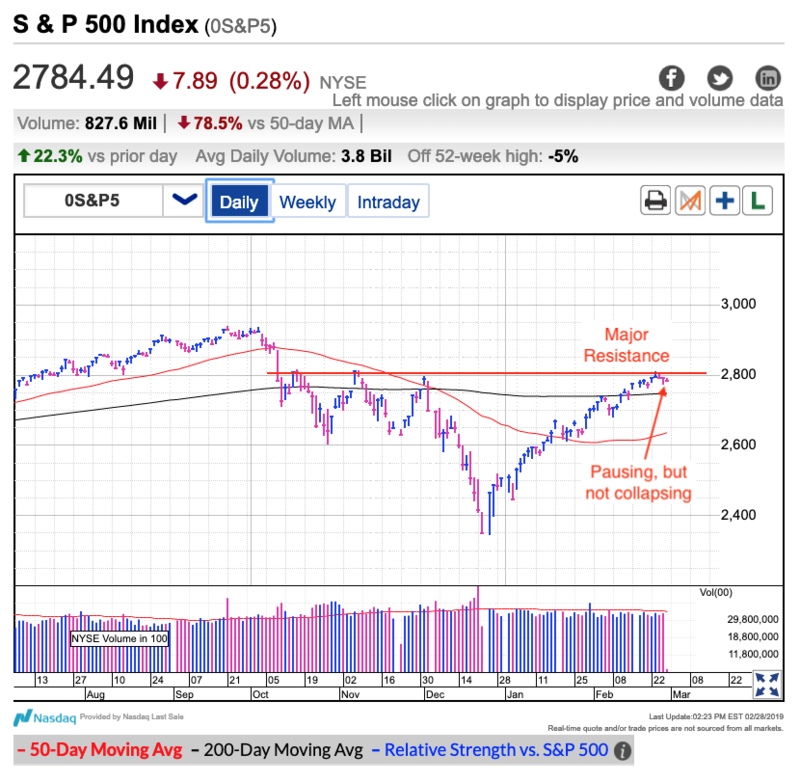 Owners’ bullishness by itself has been enough to hold us near the highs and the market is resisting the more traditional ebb and flow of prices. But given how far we’ve come and how many weak holders are still hanging on because they haven’t been shaken out during a routine pullback, one piece of damning news has the potential to unleash a torrent of selling. At the moment, the most likely culprit would be hitting a major snag in negotiations with the Chinese. Things look great and a market that refuses to go down will eventually go up. But we are on thin ice and if any selling starts in earnest, there is a lot of air underneath us. High probability of modest gains and small chance of big losses. How a person trades this is up to their trading style, risk tolerance, and time frame. Nimble day traders can keep squeezing nickels and dimes out of the upside. Anyone holding for years or decades should ignore these daily gyrations. But those of us that trade over days and weeks need to be more careful. The path of least resistance remains higher, but the rate of gains is slowing and the upside is more limited. But as long as owners refuse to take profits, expect the market to keep drifting higher. That said, given how far we’ve come, there is a good chance the next pullback will be larger than normal and is something we need to keep an eye on. The market loves symmetry and last year’s epic collapse resulted in this year’s historic rebound. But when this rally finally runs out of steam, expect the ensuing step back to rattle a lot of nerves. Everything looks great for the time being, but that will change in an instant. While a return of volatility will scare retail investors, I’m looking forward to the trading opportunities it will create.